It seems like only yesterday that I was stroking the peach fuzz head of my newborn and burying my nose in that exquisite baby scent – but time flies and, now that my children are constantly on the go, so does their hair. Added to which it gets tangled, ratty, knotty and generally a bit feral. 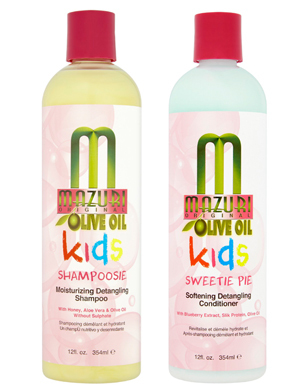 Enter Mazuri Kids, a range of paraben and SLS-free products (because avoiding nasties on your little one’s scalp is yet another concern) which uses natural ingredients – moisture-rich olive oil, honey and aloe-vera in their ‘Shampoosie’, for example – to effortlessly detangle, whilst cleansing and nourishing the scalp and hair. Developed by mums, it’s safe to use every day: follow up with the ‘Sweetie Pie’ conditioner, which uses blueberry extract and silk protein to make hair silky and manageable. Other products in the range include the “Precious Ponytail Hair Pudding” – perfect for keeping on top of tidy back-to-school locks. 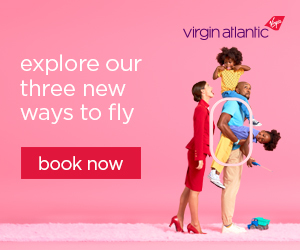 So that’s the children sorted – but what about you? 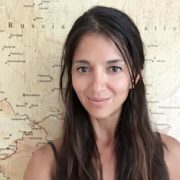 Chances are that since having children, you’ve noticed a regrettable deterioration in the quality and fullness of your hair (I developed alopecia areata after my third child, leaving me, for a time, with a glaring white patch of scalp beaconing in my dark hair) – on top of which you probably just don’t have as much time to spend on it any more. 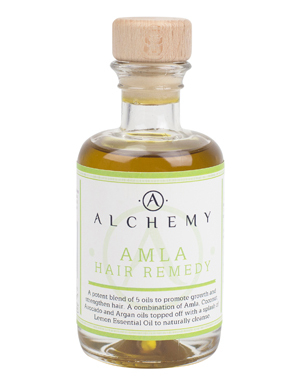 It seems counterintuitive to slather my head with oil when lank hair is such a turn-off but then, it does make sense to nourish growing things at the source – so I was cautiously open to the idea of using Alchemy’s Amla Hair Remedy, which I massaged into my scalp and then applied all the way from roots to ends. The blend of five oils – alma, coconut, avocado, Argan and lemon essential oil – had a lovely fragrance, of which I kept getting tantalising whiffs of as I left the treatment in for an hour and got on with other things. Eventually I headed to the shower where, after shampooing, I discovered that not one of the clutter of bottles in my bathroom contained conditioner. Not one! But by then it was school run time and so, feeling a bit “untamed” I set off and, astonishingly, was told by at least three people how amazing my hair looked! Thinking it over, I guess that when fuller, thicker hair is your objective, it makes sense not to weigh it down with a post-shampoo conditioner but instead to plump it full of moisture and bounce before washing – although product guidelines indicate that very thick, coarse hair will benefit from both. 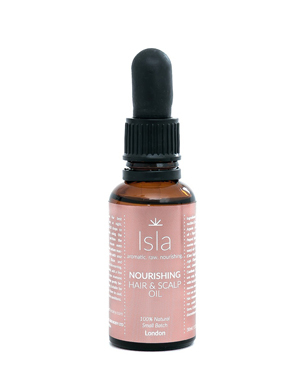 Buoyed up by these reactions, I’ve started adding a few drops of Isla Apothecary’s Nourishing Hair & Scalp Oil to my routines as well, which contains a blend of pure essential herb and spice oils to strengthen the roots, encourage growth and remedy thinning hair and dry scalp conditions. Since I’m lavishing all of this extra love on my hair, I’m inspired to contribute something more towards its cleanliness than a quick wash with whatever brand happens to have been on offer at the supermarket recently (please tell me that I’m not the only one guilty of this!). 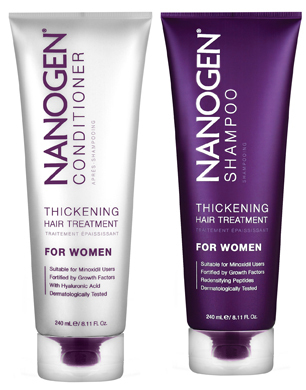 London-based brand Nanogen is renowned for its scientifically developed range of hair-thickening and scalp-revitalising treatments, which contain patented Hair Growth Factors, plus hyaluronic acid and keratin. Plant power is at play here too – there’s aloe vera and chamomile doing their soothing stuff, as well as beta-glucan – a botanical extract that benefits both hair and scalp. The brand has also recently launched a Hair Mask for weekly use: it contains a concentrated dose of those Hair Growth factors to awaken your inner Rapunzel, as well as key ingredients to soothe the scalp and ‘glossify’ the hair. Celebrity hair dresser David Mallet has also launched a volumising mask, which contains red seaweed extract to restructure the hair fibres and stimulate growth. The result? Extra volume and density. Obviously it will take time for a real growth results to be seen, although my hair definitely already looks far more lustrous and swishy than it has in a long while. In the meantime, HairRehab London is upping my school run game, with a range of synthetic and human hair pieces which, with the right colour-matching, blend seamlessly into my natural hair and take just a minute to apply. That top knot that I mindlessly bundle my hair into lacks both substance and style, since my hair’s not currently thick enough to give a bun any real shape or significance – but by securing a pre-styled one over the top of it, it looks – and I feel – instantly more ‘done’. The clip-in plait is brilliant too: intertwined with my natural locks, it gives loads more volume and fullness to my usual sparse, messy braid – and there’s none of the commitment, expense or maintenance of salon-applied extensions. So however exhausting motherhood may be, there’s no need for my mop to show the strain.